Illustrations in this presentation do not necessarily relate to the text they adjoin, but are intended to help Americans visualize the people, places, and culture of the Philippines. If any of the illustrations we have used is copyrighted and the copyright owner objects to its use, we shall remove offending illustrations upon request of the copyright owner. Nowadays it is sometimes impossible to know if something is copyrighted. On May 14, the people of the Philippines vote a new parliament into office, as President Marcos moves the country toward normal political life again after long years of one-man rule. It is important that Filipinos in the United States urge official U.S. expressions of interest in these elections to make sure no funny business deprives them of meaning. First, the United States has been injured in its own eyes and in the eyes of the world, by supporting the Marcos government during the martial-law period. To the extent we seek to regain the title of champion of democracy, we must encourage President Marcos to conform to strict norms of democratic behavior so the May elections might truly reflect the wishes of the people. Second, there is a substantial body of Philippine opinion, [then] bolstered by a political party of size [the Federal Party of the Philippines], which proposes that the Philippines petition the U.S. for admission to the Union as a state. So, a fair election might give us all a chance to undo the mistake we made in giving and accepting Philippine independence. The record of Congressional and popular debates on whether to annex the Philippines in 1898 reveals that the U.S. chose colonialism and refused even to start the Philippines on the track to statehood for reasons of racism and nothing more. It was argued that because they were non-white, Filipinos could not fulfil the duties of citizens in our democracy. Hawaii later disproved that thesis and, with a substantial nonwhite majority to this day, is doing very nicely, thank you. The Philippines, annexed at the same time as Hawaii but never incorporated as a territory, is doing very badly, not because it is without resources, but because it is misgoverned and abused by an oligarchic elite who don't understand enlightened self-interest is the truest self-interest. We paid Spain $20 million for the Philippines, nearly three times what we paid Russia for Alaska. Several hundred thousand dollars more was later paid for the Sulu Archipelago, which we merged into the Philippines in 1940. We put millions of dollars into infrastructure, sanitation, and education from 190 to 1941, and the, after most of these improvements were ravaged by the campaign to force the Japanese out in World War II, tens of millions more to rebuild. To what end? The Philippines is a classic example of Third World backsliding in which entire countries sink into a hole so deep that not only can the people to climb out on their own but they can scarcely see the sky. The Federal Party of the Philippines, political arm of the Philippine Statehood U.S.A. Movement, claims 9 million members and is fielding candidates in the May elections. Should the Philippine Statehood people win big, parliament might present Congress with a petition for statehood this year. The U.S. government should make clear well in advance of the election (1) that we insist upon free and fair elections, so any attempt by the Marcos government to carry off a charade will result in absolute cutoff of all forms of U.S. support; and (2) that if the Federal Party should gain control of parliament and petition for reannexation, the United States will grant statehood. Such paired declarations should come from all candidates for President of the United States, in all parties, and from the leaders of both majority and minority parties in both Houses of Congress. But they are unlikely to make such declarations without pressure from the Filipino-American community. When Ferdinand Magellan, Portuguese explorer in the service of Spain, landed in Cebu in 1521, he planted a cross to claim the land for Catholicism. Magellan was killed by the natives, but Catholicism took root and binds the 90% of Filipinos who are Christian firmly to the West. 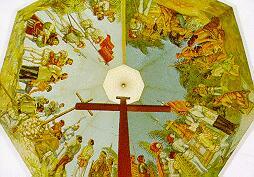 The spot where Magellan planted his cross is to this day marked by a cross. I could offer many arguments which seem to me persuasive, about how U.S. interests would be advanced by Philippine statehood, but that would put the case too narrowly. Instead, let me address our reasons, personal and national, for being on this planet. John Donne said it best 360 years ago: "No man is an island, entire of itself . . . any man's death diminishes me, because I am involved with mankind; and therefore never send to know for whom the bell tolls; it tolls for thee." The death of democracy, the death of hope across the Third World diminish all who are "involved with mankind". As a nation, we have lost our way, our very reason for being. The revolutionary vision that moved the Founding Fathers and pioneers to break with the wicked Old World and create a New World (what Lincoln called "the last, best hope of earth"), is dead, and we are much diminished for it. Surely the whole world  First, Second, and Third Worlds without distinction  needs that kind of change and cleansing which people like Paine and Jefferson had in mind. "These are the times that try men's souls" could have been written this morning. "We hold these truths to be self-evident, that all men are created equal" surely means all men everywhere, not just within the 13 states of 1776 or the 50 states of 1984. There are whole new worlds to conquer, worlds of poverty and despair where entire families live in lengths of sewer pipe; where people use rivers for bathing, washing clothes, drinking and elimination, all within sight of one another; where many, even most children die before their sixth birthday and the average life expectancy is less than 42 years. This is the Third World, exploited and abused in the past by colonial powers but never lifted to Western standards. This is a world on the fringe of which the Philippines sits and to which the Philippines can be our introduction. Lessons we learn in cooperatively developing the Philippines, lessons about efficacy, motivation and culture, can help us end the suffering that passes for living in most of the Third World and, thus, most of the world. Edgar Allan Poe wrote a masterful short story called, "The Masque of the Red Death" which provides prophetic warning to the Entertainment Society of 1984 that basks in the glow of TV screens while all around death and destruction rain on our neighbors. Poe said there are no walls high enough to keep out a plague, and his message is worth heeding. Escapism in video games, sitcoms, booze, drugs and stereo headphones behind national borders is no defense against the plague of poverty and violence that is ravaging the world. Sooner or later the walls will be breached, by which time it may be too late to do more than kill while being killed. We can cling to escapism and isolationism if we wish, but we'll eventually pay a very high price, far higher than the cost of developing the world. I should rather we send doctors and medicine into a sick world than hide in our homes and be found by the plague anyway. The Founding Fathers meant the American Revolution to sweep the world, but the U.S. forsook that goal as cultural arrogance. It was no such thing. Perhaps the Philippines can remind us of our national purpose and start us changing the world again.